Haitian Prime Minister Jean-Max Bellerive told CNN the death toll from the earthquake that rocked his country could be "well over 100,000." Haitian Prime Minister Jean-Max Bellerive told CNN Wednesday the death toll from the earthquake that rocked his country could be "well over 100,000." The 7.0-magnitude quake struck Tuesday afternoon, and has left Port-au-Prince, the capital city, in ruins. Canadians with family in Haiti can call the Foreign Affairs Emergency Operations Centre in Ottawa at 800-387-3124, 613-943-1055, or email sos@international.gc.ca. Canadians in Haiti can get in touch with Canadian Embassy officials in Port-au-Prince by calling 613-996-8885. No official casualty numbers have been released yet. 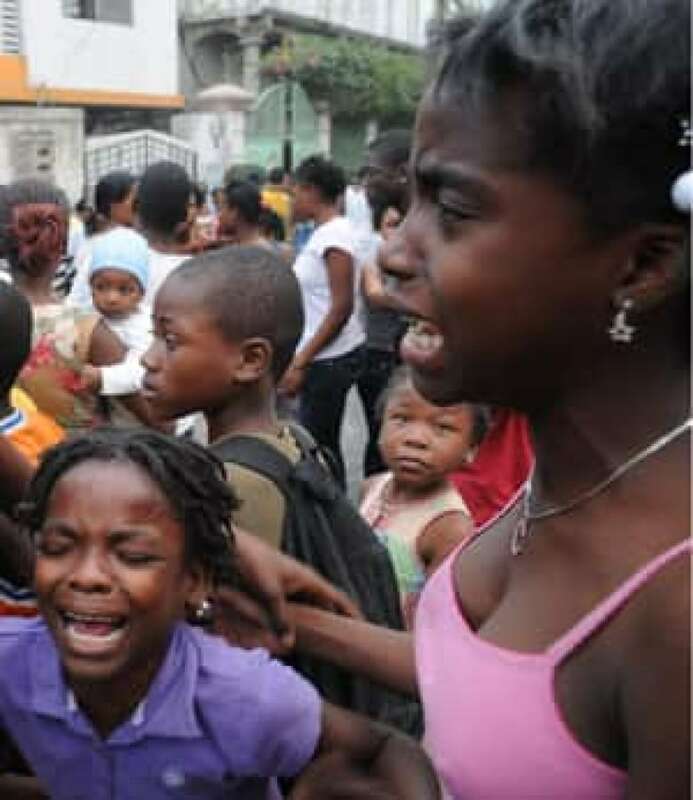 Haitian President René Préval told the Miami Herald Wednesday he has been stepping over dead bodies and estimated thousands of people were killed. He said Bellerive's projection may be high because it was based on the extent of the destruction rather than firm counts of the dead. "We have to do an evaluation," Préval said, describing the scene as "unimaginable." "All of the hospitals are packed with people. It is a catastrophe,'' he said. To help those affected by the earthquake, here's a list of organizations accepting donations. Shattered communication systems in the Caribbean country made it impossible to immediately determine the number of casualties from the Tuesday afternoon quake, but an International Red Cross official estimated that three million people in the impoverished country of nine million may have been affected and could need emergency aid. Paul Conneally said it would take a day or two to get a clear picture of the number of dead and injured, as well as the damage. UN Secretary General Ban Ki-moon appealed for massive aid for Haiti and announced that the United Nations is releasing $10 million US from its emergency funds. "There is no doubt that we are facing a major humanitarian-assistance emergency and that a major relief effort will be required," he said. Ban said the earthquake has had a devastating impact on Port-au-Prince, while other areas of Haiti appear to be largely unaffected. "Buildings and infrastructure were heavily damaged throughout the capital. Basic services such as water, electricity, have collapsed almost entirely," he said. Aftershocks also continued to rattle the capital. Scores of injured people lay in the streets of Port-au-Prince early Wednesday as aid groups around the world prepared to provide disaster relief. A map showing the epicentre of the quake. Simon Schorno, a spokesman with the International Committee of the Red Cross, told The Associated Press that finding and rescuing survivors will be a priority, and aid workers will also help hospitals cope with casualties and establish clean water sources. He said the 7.0-magnitude quake had caused "massive destruction in all the main neighbourhoods" of Port-au-Prince. "Haitian Red Cross staff are trying to do what they can but are completely overwhelmed, so there's no structured response at this point." Officials feared hundreds, and possibly thousands, of people were killed in the quake. The National Palace was badly damaged and thousands of homes were damaged or destroyed. The UN also reported Wednesday that the main prison in Port-au-Prince had collapsed and an unknown number of inmates escaped. Worldwide relief efforts have begun in earnest, with countries pledging to provide aid, including rescue workers, doctors and supplies. U.S. President Barack Obama promised an all-out rescue and humanitarian effort, adding that the U.S. commitment to its hemispheric neighbour will be unwavering. A Homeland Security official also said the U.S. will halt the deportation of Haitians who are living illegally in the country in light of the earthquake. Those who were to be deported to Haiti will remain in U.S. detention centres for now. Prime Minister Stephen Harper said Canada "stands ready to provide any necessary assistance to the people of Haiti during this time of need." The government will deploy the Disaster Assistance Response Team (DART) — Canada's team of 200 Canadian Forces personnel, which provides help to areas affected by disaster for up to 40 days. A 20-member reconnaissance team is due to land in Haiti on Wednesday afternoon to determine how best to assist the country, said Minister of Foreign Affairs Lawrence Cannon. Other nations — from Iceland to Venezuela — said they would start sending aid workers and rescue teams. Cuba said its existing field hospitals in Haiti had already treated hundreds of victims. The United Nations said Port-au-Prince's main airport was "fully operational" and open to relief flights. 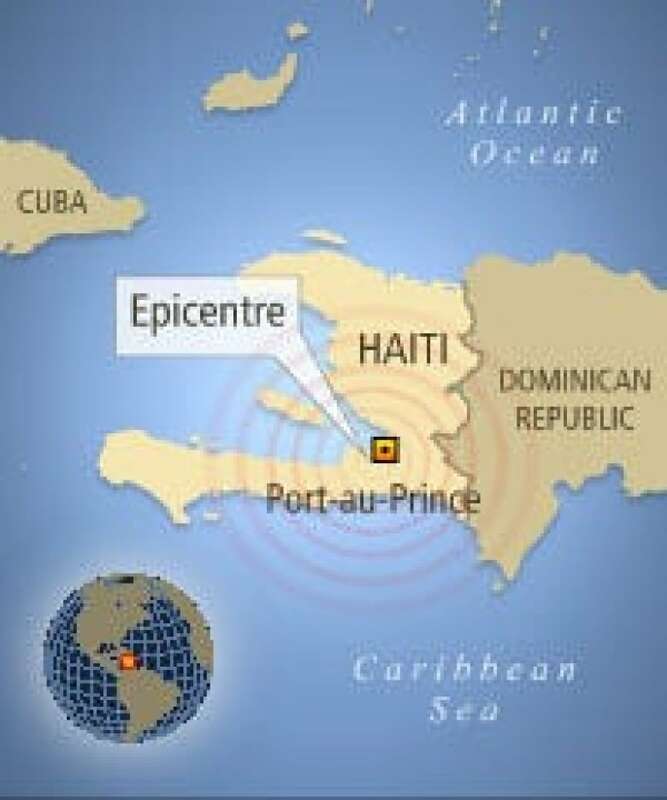 The quake struck at 4:53 p.m., centred 16 kilometres west of Port-au-Prince at a depth of eight kilometres, the U.S. Geological Survey said. 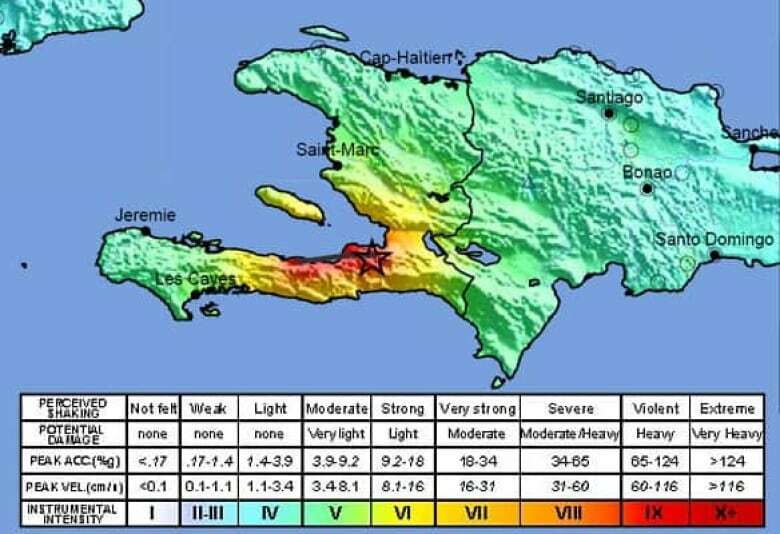 USGS geophysicist Kristin Marano called it the strongest earthquake since 1770 in what is now Haiti, on the island of Hispaniola. Most of Haiti's people are desperately poor, and after years of political instability, the country has no basic construction standards. Tuesday's quake was also felt in the Dominican Republic, which shares the island of Hispaniola with Haiti, but no major damage was reported. In eastern Cuba, houses shook, but there appeared to be no significant damage. Jan. 12, 2010: Port-au-Prince, Haiti. Magnitude: 7.0. Widespread damage as epicentre of quake was 15 kilometres outside the capital. Number of dead unknown. May 2, 1787: Puerto Rico. Magnitude: 8.0. Possibly the strongest earthquake to hit the region. It caused widespread damage across Puerto Rico. YOUR VOICE: If you're affected by the quake, please send us your photos, videos or stories.